We had been invited to Tasmania to attend a friend’s wedding and, having lived in the Middle East for over 10 years, Mr MAP is not overly fond of cold climates. When we arrived in Hobart and I saw snow at the top Mount Wellington I just knew we had to go up there and show Mini Monkey. Equipped with snow gear for the boys and lots of layers for the rest of us we drove up the windy road to the top. The Mini-Adventure gods must have been looking kindly upon us as the rangers were just on their way down from opening up the road. 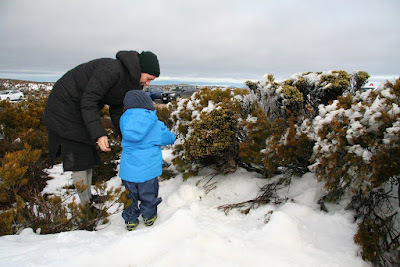 Once we were all rugged up, Grandpa and Mr MAP showed Mini Monkey the family secret of how to make a good snowball and had him practice on Adventure Jane and Grandma. Despite only being two, Mini Monkey has deadly accurate aim (at short distances) and had great fun pelting everyone with snowballs handed to him by his father. Comments from The Giant Baby: Snow suits are rubbish. I can’t move in this contraption. I heard them laughing at me and calling me a ‘starfish’. I don’t know what a ‘starfish’ is, but it can’t be good. Opening hours: Wellington Park is always open, excepting in extreme weather (including snow or ice cover). 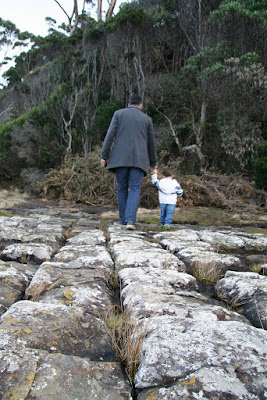 The hour and a half drive down to the Tasman National Park form Hobart was superb. It takes you down undulating roads, along-side rugged bays and through dense forests. Our first stop in the park was The Blow Hole. I had envisaged a spectacular display of the force of nature with water booming up in a massive fountain. Due to the pleasant weather we were experiencing, the reality was more of a wet thud with a bit of splash. Our second stop of the park was the Tessalated Pavement. This is essentially flat rock beach (a wave cut platform, for those of us with an inner geek) with formations on the rock which look like loafs of bread. Mini Monkey loves climbing on rocks so this adventure was right up his street. Obviously, between the loafs are cracks and in the cracks are pools of water. It was only a matter of time with that many rock pools before Mini Monkey decided he needed to be in one. Wet Foot Count: two. I don’t often take my camera out with us so I was having a great time trying to take photos of the family and not paying attention to where I was putting my feet. Wet Foot Count: three. Comments from Mini Monkey: I like puddles. I like to jump in puddles. I don't like wet socks. The puddles near the water were cold. Green rocks are slippery. I couldn't find any crabs or ottopusses.